For months we’ve been hearing that Apple’s next iPhone could focus on fitness, but now we’re seeing more details about the technology it may use to learn about your health. 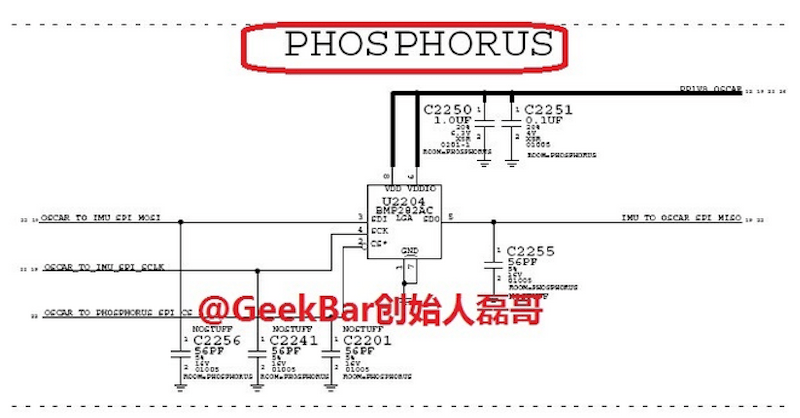 Chinese iPhone repair service GeekBar has posted more leaked schematics that reportedly show what’s inside the iPhone 6. Within those schematics are details on a chip that’s codenamed Phosphorus, as G For Games first spotted on Chinese social network Weibo. The chip is said to be Apple’s successor to the M7 co-processor inside the iPhone 5s. The M7 is a smaller chip that Apple has created just to collect motion data from your iPhone’s accelerometer, gyroscope, and compass. Apple’s A7 chip, which powers most of the iPhone 5s’ functionality, is capable of measuring this motion data, but Apple claims its M7 co-processor is more efficient and saves battery power. Numerous fitness apps such as Strava Run and WeatherRun integrate with this M7 chip to give you more accurate feedback about your workout. Apple’s new chip, however, would be tasked with processing even more data such as heart rate, burned calories, cholesterol levels, and blood sugar in addition to tracking your motion, according to G For Games. The hardware would integrate with Apple’s recently announced HealthKit platform that’s set to debut with iOS 8 in the fall. HealthKit is Apple’s new hub for monitoring your daily health stats over long periods of time. It’ll be able to talk to all of your health apps so that you can keep track of your statistics in one place, and you’ll be able to choose which information you want to share with these apps. This is just one of several indicators that Apple is looking to push into the health space. Apple is reportedly in talks with health care providers at Mt. Sinai, the Cleveland Clinic, and Johns Hopkins about how its HealthKit platform could work with their services, Reuters reported earlier this month. Many believe that Apple is beefing up its presence in the health industry to prepare for its much-rumored iWatch launch — which is expected to be promoted as a fitness device. We expect to learn more about the iPhone 6 and the iWatch in the coming months. Apple is reportedly set to unveil the iPhone 6 at a press event on Sept. 9 and the iWatch could debut in October. We’ll have to wait until Apple sends out invitations to know for sure.